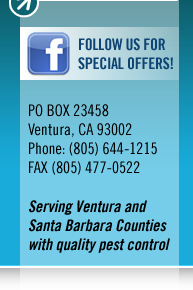 Pest control and fumigation coupons, special offers and deals from Shoreline Pest Control in Ventura and Santa Barbara counties. Order your inspection online and receive $25.00 off your inspection fee. As a special bonus to our clients we have added a fast and easy way on ordering your inspections online. This feature will help streamline the order process and avoid any miscommunication. Just send your information in via our Contact Form and we will apply this discount to your order TODAY!